Dates of birth and death unknown. Born in Ôsaka, he was the brother of Bandô Iwagorô. He settled in Edo where he became the disciple of Bandô Matakurô II. He was a travelling actor for a while. Fall 1743: Kunigorô settles in Kyôto. 11th lunar month of 1743: he he becomes katakiyaku, playing in Kyôto at Hoteiya Umenojô's theater two villains roles in the kaomise drama "Yomeiri Ôshimadai", which is produced by Nakamura Kumetarô I. This is his first-recorded stage performance in Kamigata ôshibai. Summer 1749: successful tour in Ise. 11th lunar month of 1749: Kunigorô plays the role of Banba no Chûta at the Naka no Shibai in the kaomise drama "Fûryû Gosho Zakura", which is produced by Nakamura Jûzô I. 1st lunar month of 1750: Kunigorô's rank in the Ôsaka hyôbanki, katakiyaku section, is jô-jô-(shiro)hankichi (superior - superior - (white) half excellent). He shares the same rank with Nakamura Danzô. 11th lunar month of 1754: Kunigorô plays at the Ônishi no Shibai the role of Tezuka Satoemon in the kaomise drama "Uda Genji Asahi no Menbako", which was produced by Wakayama Bunshichi. 11th lunar month of 1755: Kunigorô plays at the Naka no Shibai the role of Chidori Hamaemon in the kaomise drama "Jidai Sewa Kogane no Hanazoroe", which is produced by Bandô Toyosaburô I. 11th lunar month of 1756: Kunigorô plays at the Ônishi no Shibai the role of Kugami Tanbei in the kaomise drama "Ômatsu Kyokusuke Tanzen Roppô". 11th lunar month of 1757: Kunigorô plays the role of Ôba Saburô in the kaomise drama "Sakiwake Musha Kôbai no Tazuna", which is produced by Anegawa Shinshirô II at the Naka no Shibai. 11th lunar month of 1759: Kunigorô performs at the Kado no Shibai in Namiki Shôzô I's kaomise drama "Saiwai Genji Chôkyû no Maki", which is produced by Nakayama Bunshichi I, celebrates the comeback in Kamigata of Nakamura Tomijûrô I and the shûmei of Arashi Koizô I. 1st lunar month of 1760: Kunigorô's rank in the Ôsaka hyôbanki, katakiyaku section, is one black stroke above jô-jô-(shiro)kichi [visual]. 11th lunar month of 1760: Kunigorô becomes jitsuaku and plays at the Naka no Shibai the role of Makinoshima Okuzaemon in the kaomise drama "Miura no Ôsuke Toshitoku Môde", which is produced by Anegawa Shinshirô II. 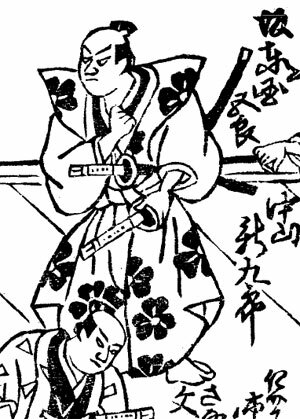 1st lunar month of 1761: Kunigorô's rank in the Ôsaka hyôbanki, jitsuaku section, is jô-jô-(shiro)kichi (superior - superior - (white) excellent). 9th lunar month of 1761: Kunigorô plays at the Naka no Shibai the role of Sudô Kuhachirô in the drama "Onna Hinin Katakiuchi". This is most likely his last-recorded stage performance in ôshibai. We don't know what happened to him afterwards. Bandô Kunigorô I was a popular Ôsaka katakiyaku and jitsuaku actor, who was active in his native city from the end of the 1740s to the beginning of the 1760s. He was jitsuaku only for one season. He had a great stage presence and his kôseki was highly-praised.